Had a late morning since we we're only going to do the Caldeira today. Weather looked good and I started with a short walk around the village. 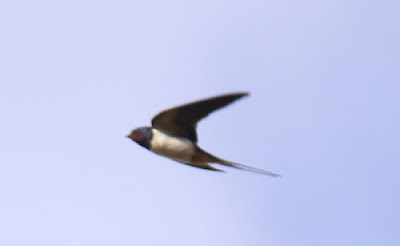 Soon got on to the Barn Swallows which turned out to be three. Unfortunately they all are European ones, which is NOT good! We don't want birds coming from that side of the Atlantic! Adult European Barn Swallows. Note small throat patches, broad breast-bands and white bellies. As we got up to the crater it was foggy and rainy so we had to do plan B instead. Too bad we didn't have a plan B! We took a walked a bit we north along the western edge of the island. Saw very much fog and rain but not many birds. Let's hope the weather is better tomorrow! 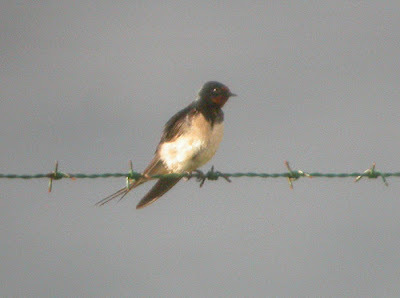 Pity about the weather at present - hopefully things will pick up - 2 Veerys now on Shetland.....the pressure is on !